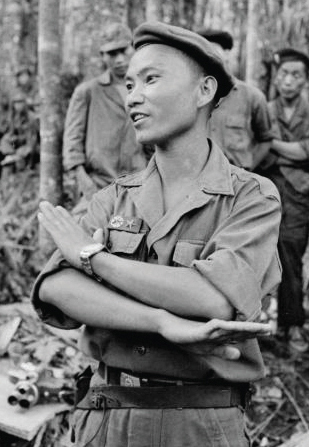 Gen. Vang Pao is a leader and iconic figure in the Hmong community, and a key U.S. ally during the CIA-backed Secret War in Laos, a part of the Vietnam War, from 1960-1975. -- Noah Vang, author, Jan. 2011. Courtesy GVP Family. 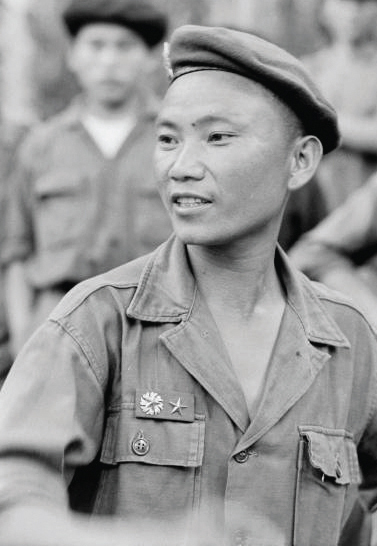 Vang Pao has been widely portrayed by his Hmong supporters and the US media as an American war hero and venerated leader of the Hmong people. The former CIA chief William Colby once called him ‘the biggest hero of the Vietnam war’. — The Guardian, Feb. 2011. Courtesy GVP Family. -- Sen. Sheldon Whitehouse, Hmong Veterans' Service Recognition Act, May 2018. Courtesy Xang Vang. 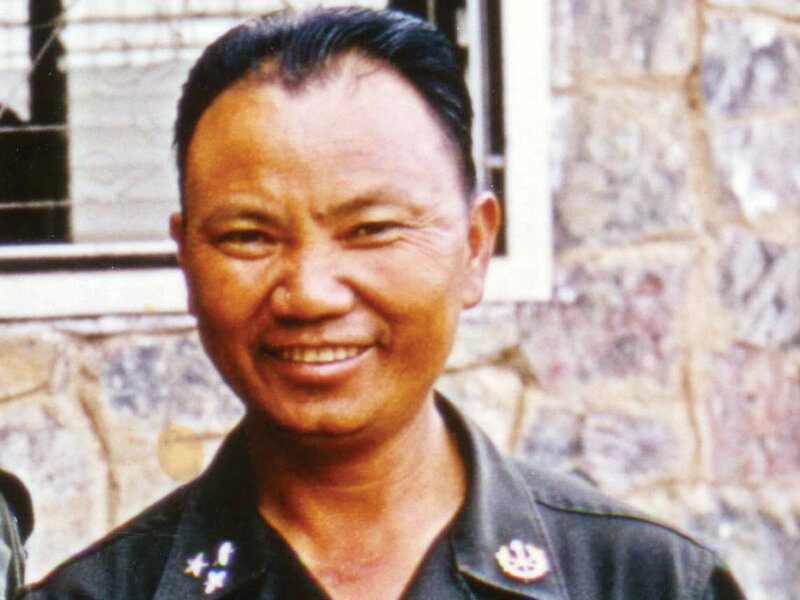 General Vang Pao was one of the greatest military commanders during the Secret War in Laos, a part of the Vietnam conflict, from 1960 to 1975. He began his military career as an officer in the French army in the early 1940s. Later, as a major general he commanded the Royal Lao Army’s Military Region II, which he fought to protect in order to preserve democracy, freedom, and liberty for his country. Furthermore, he assisted the United States in her quest to stop the spread of communism in Southeast Asia during this military conflict. As a leader, he dedicated his lifelong career to seek justice and promote the importance of education, cultural preservation, family unity, and public service to his people worldwide. 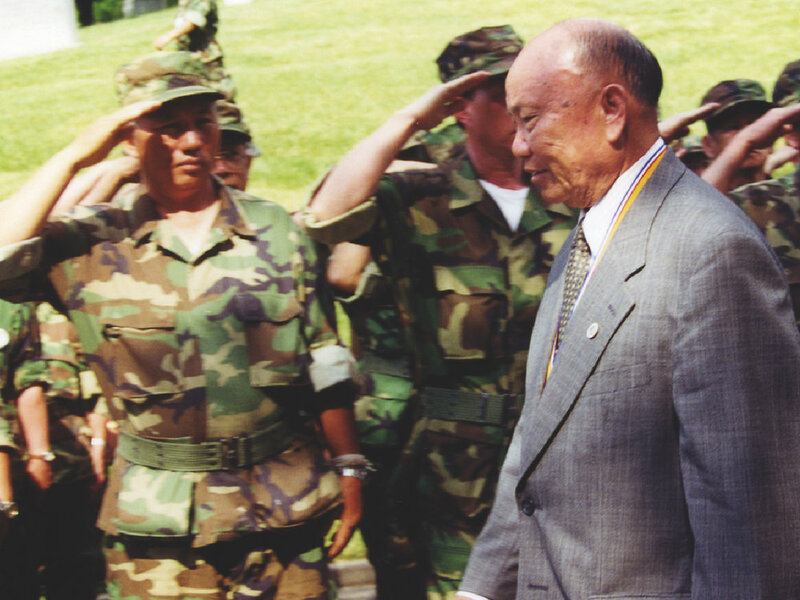 Today he is revered and will be remembered by many as the Father of the Hmong People. Nai Phoo Vaj Pov yog ib tug thawj tub rog tshaj lij heev nyob rau kob tsov rog Secret War nyob hauv lub tebchaws Lostsuas thaum xyoo 1960 txog 1975, uas yog ib feem ntawm kob tsov rog nyab Laj. Nws tau pib ua hauj lwm tub rog nrog rau tsoom fwv Fabkis thaum 1940 tawm ntawd. tom qab no uas nws tau txais lub meej mom ua tus tuam thuaj tub rog peb lub hnub qub dawb lawm, nws kuj los tuav tsoom tub rog nyob rau sab ciam teb 2 uas nws tau los tiv thaiv lub tebchaws Lostsuas kom muaj kev ywj pheej, vaj huam sib luag thiab vam meej rau nws lub tebchaws. Nws kuj tau pab lub tebchaws Ameliskas tiv thaib tawm tsav tog kooj sam nyob rau hauv Asia sab hnub tuaj qab teb. Los ua ib tug thawj coj, nws tau muab nws lub neej los tho txoj hau kev kom muaj kev ncaj ncees, txhawb nqa kev kawm ntaub kawm ntawv, Hmoob tej kab lis kev cai, kev thooj siab koom ntsws, thiab kev nrhiav noj nrhiav haus rau ntawm nws tsev neeg nyob qhov txhia qhov chaw. Niaj hnub no coob leej ntau tus hawm txog nws yam li ib leej Txiv ntawm haiv neeg Hmoob. 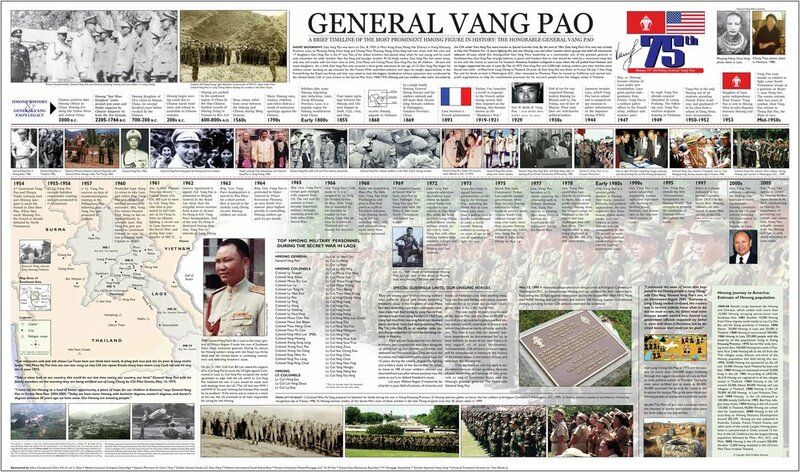 In 2006, I created this “General Vang Pao” poster as a gift to honor his contribution to our history and people at Prom Center in Oakdale, Minn. Courtesy Noah Vang. 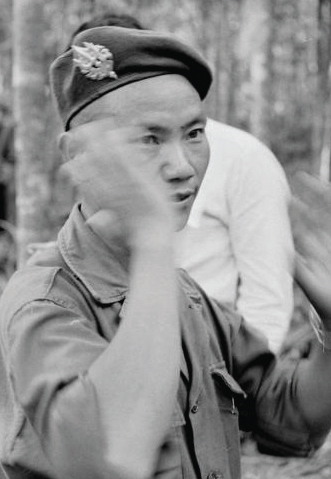 Below images of Vang Pao were taken in Padong, Laos, in 1961-62 (from Times Magazine). Gen. Vang Pao organized a farewell party for Bill Lair in 1968 at Long Cheng, Headquarters of Military Region 2, in Laos. Next to Lair is his deputy Pat Landry. Courtesy Bill Lair. In 1960, the C.I.A.’s Bill Lair recruited Vang Pao, an officer in the Royal Lao Army, to lead the agency’s paramilitary fight upcountry. Vang Pao had said, “‘We can’t live with the Communists,’” Lair recounted seven years ago in an interview for the Vietnam Archive Oral History Project at Texas Tech University. “‘You give us the weapons, and we’ll fight the Communists.’” In the final days of the Eisenhower administration, the C.I.A. began shipping weapons and military materiel to the Hmong. (Click here to listen to his interview by Tim Weiner of The New Times). President John F. Kennedy speaks at news conference regarding the dire situation in Laos. Courtesy JFK Library. President Kennedy: “I want to make it clear to the American people, and to all of the world, that all we want in Laos is peace, not war -- a truly neutral government, not a cold war pawn, a settlement concluded at the conference table and not on the battlefield. An NBC documentary about Gen. Vang Pao and his troops during the war (Vang, 1970). Thumbnail image courtesy Col. Ly Teng. Video clip of British reporter touring frontline with Gen. Vang Pao and his army, late 1960s. Pearson TV, London. 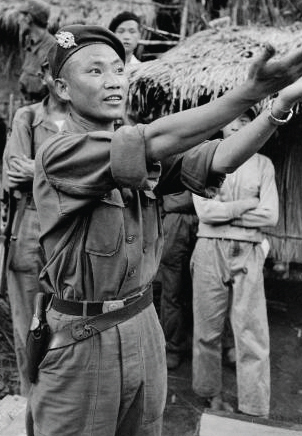 Operation Kou Kiet in 1970-71 of the Secret War in Laos (from 1960-1975). Courtesy GVP Family. All my life, I have devoted everything to my Hmong people. I consistently sought out the best for them. I always encouraged every child to reach his or her full potential because they are our future. General Vang Pao reads to students at Hamline Elementary School in St. Paul, Minnesota. Photo from school collection. Fresno Unified School District names an elementary school after General Vang Pao in Fresno, California, c. 2012. Thua Vang Collection.